Hanoi (VNA) – A seminar on the sustainable development of cities was held in Hanoi on April 9 between enterprises of the Netherlands and the Vietnamese capital. The event aims to further tighten the friendship between the Netherlands with Vietnam in general and with Hanoi in particular as part of the ongoing official visit to Vietnam by Dutch Prime Minister Mark Rutte. Speaking at the seminar, Chairman of the municipal People’s Committee Nguyen Duc Chung briefed participants on Hanoi’s socio-economic development achievements, with high and stable economic growth. Hanoi is accelerating deeper integration into the global economy, he said, adding that it always pays attention to improving the business and investment environment to attract foreign investment. He affirmed that the seminar is a good opportunity to promote win-win cooperation between the two sides, expressing his belief that cooperation between Vietnam, Hanoi and the Netherlands will be made even stronger with prominent achievements in the time ahead. According to Chung, the Netherlands is among Hanoi’s potential investors, with total investment reaching over 606 million USD. Dutch culture is also not unfamiliar to the people of Vietnam and Hanoi. The Hanoi-Amsterdam High School for gifted students is one of the symbols of friendship between the two capital cities. 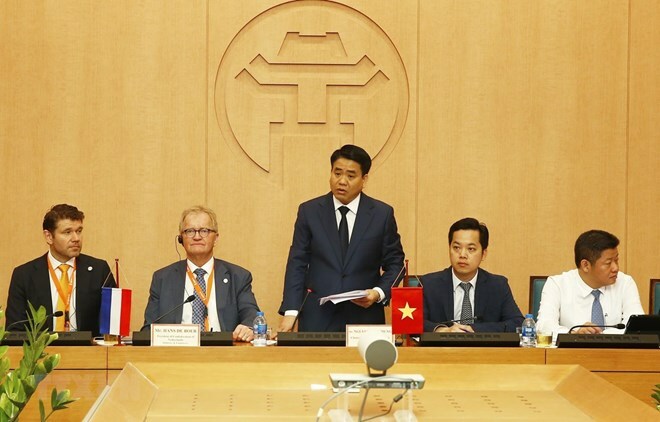 Hanoi wants to learn from experience of the Netherlands and hopes to expand cooperation with the European country in wastewater treatment, Chung said. President of the Confederation of Netherlands Industry and Employers Hans de Boer said the visit of Dutch Prime Minister Mark Rutte to Vietnam shows that the Dutch government appreciates the friendly cooperative relationship with Vietnam, as well as admires the achievements made by Hanoi and Vietnam in recent years. He said that the seminar offers an opportunity for businesses of the two sides to share experience, thus opening cooperation opportunities and strengthening bond between the Netherlands and Hanoi. During the seminar, representatives from the two sides’ enterprises offered and discussed solutions, expressing their willingness to establish cooperation. Officially establishing diplomatic relations on April 9, 1973, Vietnam and the Netherlands have since built good friendship and cooperation.